MANILA, Philippines - They say absolute power corrupts absolutely. But what of those who go off to do their own thing? Young STAR talks to a group of political offspring about legacies, family, and driving a Ferrari. It’s easy to look at those in power as already corrupted by it. Members of the Senate, Congress, councilors — all of them assumed to be malevolent or too dumb to handle or even properly assess national affairs. So when the children of those in power come of age and step into the world of young adulthood, what else is there to assume but to see them as spoiled, stuck-up, and with a bloated sense of entitlement? Every generation is prone to disagree with the one that came before it. They equip themselves with answers to questions like “What are the good things my elders have done?” and “What mistakes of theirs can I learn from?” and “How do I make a name of my own?” And so, we talked to a select group of political offspring — Toff de Venecia, Regina Belmonte, Simon Romulo-Tantoco, and Sandro Marcos (through email interview) — and asked them what it means to hold some of the most politically charged last names in the country. YOUNG STAR: What do you think is the biggest misconception of being in a political family? Simon Romulo-Tantoco: I think it’s that we can do whatever the hell we want, but it’s the opposite. We have to be more careful with our actions because it will not only affect us, but more importantly, our relatives who are currently in the public eye. Regina Belmonte: It is the stereotype, no? That we’re entitled. “Oh, drive your Ferrari around Manila,” all that stuff. 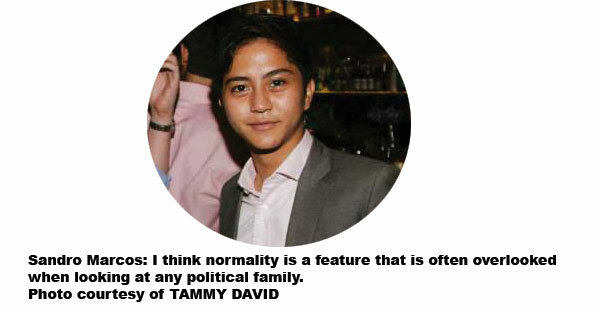 Sandro Marcos: I think normality is a feature that is often overlooked when looking at any political family. People have the misconception that we don’t function like the average Filipino family, when in reality, even though we are given certain responsibilities, we also experience the everyday obstacles and problems that normal families also do. Did you guys feel pressured to ever enter political careers? Regina: Not really. It was always a running joke, ‘cause I’m the eldest, so when I graduated from Ateneo, I wasn’t really working for the first few months after college. My grandpa (Speaker Sonny Belmonte) joked, “O, you wanna run for konsehal?” And I’m like, “Nope! I’m gonna get a job tomorrow!” (Laughs) It’s not something we see as a career. It’s not a dynastic thing. Personally, I would never, ever run, because I know I’m not qualified. I took a Communications course. I’m a writer by profession. How am I gonna help? I don’t know the first thing about public administration. It would be more of a detriment to the country that I do that, so it’s not even an option. Simon: For me, with regards to running in the future, I remain ambivalent with that decision, kasi I know the things I would have to sacrifice. It can also bring good to me aside from sacrifice. So I still have to think that out. But if ever I do decide on something, I’ll make sure that I’ll be ready for it. Toff de Venecia: Are you kidding me? They talk to me about joining politics every day. (Everyone laughs) But not as much anymore, thankfully. At the dinner table, they used to try to convince me and give their pitch and I’m like, no! I don’t think politics is the only way to give back to society. Arts is one of many powerful vehicles. I always bring it back to that. I took Political Science in college, but not ‘cause I had plans of joining politics, but because I wanted to understand what my family was doing since I was born into it. And what I learned about it, in fairness, I really enjoyed — the political theories, the local government case studies and all that. But yeah, back to your question: pressure it’s always there. If it’s not my parents, it’s the people who know my parents. And they’re like, “Oh, when are you gonna take over?” No, sorry, I’ve committed my life to something else and I wanna give back to and through the arts which needs a lot of help. Have you guys ever felt that, because your last names are so charged and because your relatives are big people, do you think that what they’ve accomplished gets in the way of the legacy you wanna build for yourselves? Regina: It’s more of a challenge, really. I think it’s also because I’m the eldest grandchild on all sides of the family so I feel like I have to set the bar high, but they’ve already set the bar high so you have to catch up. Like, it’s more inspiring than anything else that you’re coming from this. My grandfather has done so much, my grandmother founded the newspaper that I write for now. My dad still runs the Philippine STAR. I didn’t work there for years because I didn’t want to come in not ready for it also. Regina: But it’s a double-edged sword in that sense. Because while it opens doors for you, “Oh you’re a Belmonte,” they assume you’re like this, you’re nice, you’re whatever. It’s easy, but at the same time, they’ll also use it against you, “Oh, you have everything you have because of your surname.” I get anonymous comments from people on the Internet, like, “You only got your job at Summit Media because of your parents, and your family has influence,” and the thing is, they didn’t even know that I got that job until after I applied for it. I really got it on my own, but people will assume right away that it’s influence that got me there. So you have to work that much harder to prove yourself also. What has been the biggest lesson you think you learned about your family’s political career? Toff: I think if you believe in something with all your heart, and you want to affect genuine change, you should hold on to your beliefs and not succumb to political pressure. You always have to keep yourself in check. Although that’s easier said than done, because sometimes, you have to adjust, play the game, to be able to affect the kind of change you want in the long haul. It’s important to have vision, to see the bigger picture, to have a dream, and to stick to it no matter what. Sometimes you’ll feel like you’re fighting a hopeless battle; but then, if you’re so sure about what you want to achieve, change will happen, somewhere, somehow. You guys come from families who are kind of almost always under the public eye. They might get mixed up in certain controversies or stories that might be misconstrued by the press. Have you ever experienced having to speak up for your family or having to defend your family for something that they did or didn’t do? Sandro: Definitely, but having grown up in that atmosphere where your family is under the media’s eye more often than not allows for you to learn very quickly how to somewhat live with these conceptions or misconceptions, whatever they may be. I have had to stand up for my family more than once before. When people ask me probing questions and such, I don’t get mad at them for it, I just feel it’s important that I give the information that I know and believe to be true. As a result, hopefully changing their opinions. Regina: It’s not really my job to do that. I used to be very thin-skinned; every time I heard bad things, it affected me. But now I’m like, I’m just gonna step off and let them handle it, they know what they’re doing. I know nothing about politics. I purposely know nothing about it ‘cause I don’t wanna be involved, ever. They know how to handle their own press. You guys being in the position you’re in, what are your views on dynasty politics? Simon: Meritocracy is the ideal. There are certain political families who achieve the proper merits to be certified as legitimate candidates. And then also, there are certain individuals who don’t come from political families. Regina: It’s the ones who coast on their surname alone that I’m not for. If you really have the credentials for it, if you have the experience, if you know what you’re doing, then by all means. But if you’re just gonna go, “Oh, okay, I don’t know what to do with my life, I have a surname, I’ll run for whatever,” that’s what I hate. What do you guys think the government today can work on? Regina: We need new blood in office, but the new blood can’t get in because the electorate is still voting in the old blood. I’m still pissed that Risa Hontiveros didn’t make it into the Senate. They’re voting in the same old names, and some of them are certainly worthy of being voted in, but others, talaga? Wala eh. It’s a cycle. Sandro: Like with any government, there will always be agreements and disagreements with regard to the administration’s policies. If I were to say one thing, it would be about the handling of the DAP and PDAF controversies that happened recently. I wish that as a Filipino people we could all move on from this as efficiently and quickly as possible, as it has been a deterrent to further development and progress. I hope the resources that are being allocated to all of this can soon be reallocated towards making the Philippines the nation which we all know it deserves to be.